E-commerce has not only helped big corporations and businesses to grow their business internationally, it has also given everyone a level playing field. That means that moms who enjoy creating handcrafted jewelry, sculptures or cakes can now sell their products side by side with big players. Creative DIY moms can now start their own business at home, earn a decent amount of money and be there for their kids. Sounds like a dream job, doesn’t it? However, to make sure your business sets off, you need to be familiar with the business side of things as well. People who create their own products usually put more heart and soul into them without even realizing they could make a living out of their passion. To succeed, you need to have a quality product and a strong branding idea. In the e-commerce world, branding is everything. 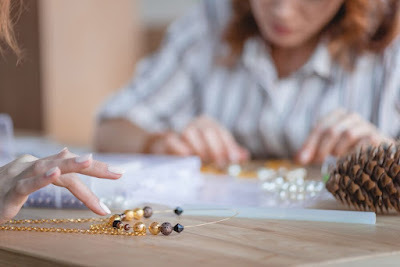 In this article, we’ll run you through the business side of selling your handcrafted products online and help you understand how you can use the internet to your benefit. No matter what you’re selling, in e-commerce packaging is as important as the product. To really thrive in this market you have to put some serious consideration into designing the packaging for your product. The reason is simple: in the online world, the package is your business’ storefront. The package has to help build your brand identity and be fun for your customers. For example, if you package your handmade jewelry into boxes resembling seashells, people are bound to share them on their social media and tag you. If you sell medical cannabis, that’s a different story. Packaging for medical marijuana has to be discreet, but that doesn’t mean you can’t put a fun spin on it. Once you get the word out, orders are bound to start coming in. You can use other websites like Etsy to sell your handmade products. And while it’s much easier it also doesn’t help your brand identity. People are more likely to tell others they bought something on Etsy and not even know or mention the name of your company. Having your own website has numerous benefits. Not only are people more likely to remember the name of your product and company, they will stay in your virtual marketplace longer and look at all the products you offer. On Etsy and similar websites, they are much more likely to wander off to another seller. Getting your own slice of the World Wide Web cake is great, but that doesn’t have to be where your sales efforts end. Finding other ways of selling your products will lead to increased interest, brand awareness and most importantly, more revenue. If your business is big enough you could even consider opening up a brick and mortar store. You can also use other online avenues such as Facebook or Pinterest. Some social media are better than the other, depending on the type of product you’re selling. For example, Instagram is great if you rely on visuals, while Facebook is a great way to connect with your customers and sell your products through a story.